A little mixed media today. The tulip image, which I love and has been sitting in a drawer for quite some time, was stamped in gold Delicata ink, as was the sentiment. After several tries, it appears that my camera skills just cannot do this ink justice. There’s a distinct shimmer to the tulips and the sentiment doesn’t look so washed out as it does in the picture…sigh. Next, I heat set the Delicata before starting to color the tulips. First I used a Distress Marker, followed by a couple of shades of Prismacolor pencils. Then, some highlights were added in with a PITT artist pen. Added a smattering of sequins and done! We are our own worst critics!! I use Delicata Golden Glitz and I think your image is stunning! 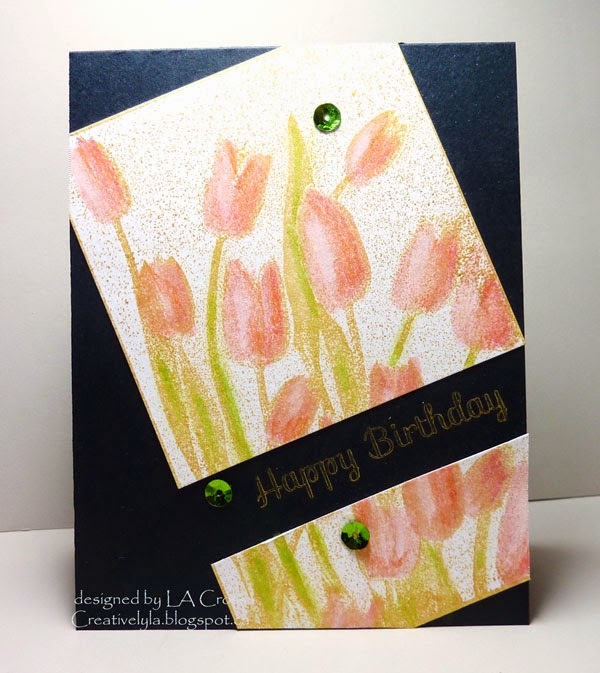 I love the colors you chose and the added sequins too! !